Hotel Penaga is a property you should consider if you want to stay in a unique and luxurious hotel in a UNESCO World Heritage Site. Book directly with the hotel for the best rates. Check-in is quick and easy, the staff speak perfect English. The reception area is clean, cool and refreshing after walking in George Town. You should take the time to appreciate the tiled floor of the reception area which was created using traditional encaustic cement tiles from Indonesia which were pressed using presses from the 1930s. A lot of thought has gone into the design, not just the design of the reception (above) but the design of whole building as you’ll see when you make your way to your room. Hutton rooms are located on the 3 floors of the main building in Hotel Penaga, all accessible by elevator. In the adjacent Clarke Terraces you’ll find suites suitable for family stays. Above the Spa are the Transfer Suites which offer views towards Penang Hill. In the garden are the Penaga Suites which are ground floor suites suitable for families. Contact the hotel directly for special offers and more information on which room is suitable for you. The rooms at Hotel Penaga come with a luxury 4 poster bed which is very comfortable, making it hard to get up in the morning. In my room there was an embroidered Chinese chair cover from the 19th century framed on the wall (above left) which added to the uniqueness of Hotel Penaga. If you like attention to detail you’ll find so much in your room as well as around the whole hotel and gardens. The floors are timber as are the beams on the roof. There is a fan as well as efficient air conditioning, if you wish to stay in a room with balcony you should request this at the time of booking. Complimentary tea, coffee and water is provided in the room as well as information on the points of interest of George Town and Penang. Something modernly unique about the rooms in Hotel Penaga is they each have their own Internet router and WiFi password. 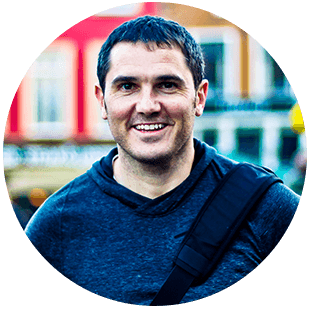 This means you are guaranteed fast WiFi as no one else can use your bandwidth. 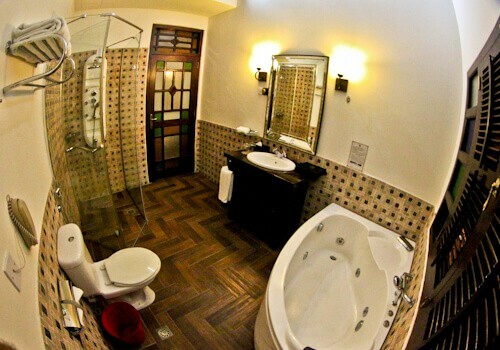 Each bathroom at Penaga Hotel includes a private Jacuzzi. The most difficult choice will be whether to take a massage shower or a Jacuzzi (or both). The bathroom amenities are excellent too, ranging from shower gel and shampoo to toothbrush and razor. 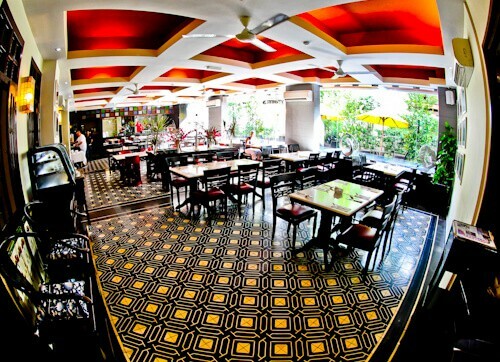 The buffet breakfast room has the uniquely tiled floor, like that of the reception. There is a choice of western or local breakfast as well as an egg station. There are polite staff happy to serve your coffee and bring your personalized choice of egg. The view from the window is the swimming pool and garden of Penaga hotel. During the day George Town is very hot, the perfect place to escape the heat is the swimming pool, you could even order a cocktail from the nearby Tanglung bar. An alternative to the swimming pool is the air conditioned library, this would be the perfect place to read up on George Town and the sites of Penang Island before heading out to explore. Fort Cornwallis, the largest fort in Malaysia is an interesting subject to read up on before walking from the hotel to see the real thing. The interior of the Tanglung bar is as stunning and unique as the rest of the hotel. The bar features glass lanterns from Guangzhou, China, Tanglung is Chinese for lantern, this is how the bar gets its name. From the exterior you can see the food promotions which were on when I visited. It is rumored that the best cocktails in George Town are served in the Tanglung bar. There are often special offers on in the Penaga Spa (ask in reception). Pictured above is the entrance to the spa, the spa area has several traditionally designed rooms throughout the building. 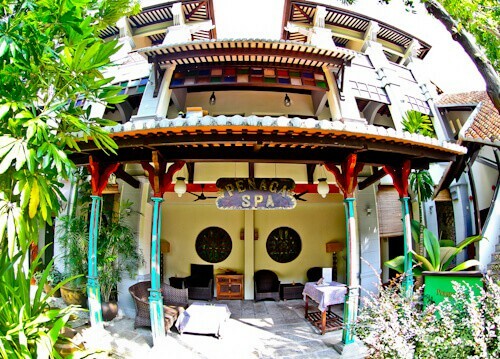 The Penaga Spa is open daily 11 am to 7 pm (closed Wednesdays). 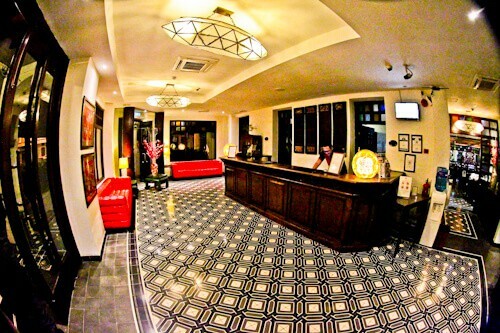 Enjoy your stay in Hotel Penaga, George Town. I’ve been to Penang but haven’t explored it much. I think it definitely merits a return visit. This post of yours only inspired that idea even more. I think this UNESCO site has much to offer and this boutique hotel looks like a great place to stay in- I love that relaxing interior decor! I liked the rustic decor of Tunglung bar. The detailed description of hotel and its facilities are very informative. 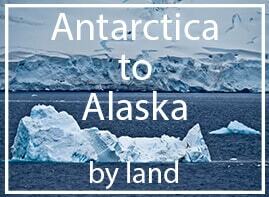 As it is an UNESCO site I would love to visit this and being a boutique hotel I will bookmark this. The unique, non chain hotels are the ones we like to stay at. The photos of the property certainly make it an attractive place to stay. As comfortable as the jacuzzi tub looks, sadly one of the most important emminities this hotel has that I need is a staff who speaks English. The tiles of this hotel reminded me of the beautifully designed tiles in Lisbon. I like when establishments put a lot of thought in making the floor appealing too. I like the bathroom a lot. I can spend hours there just relaxing and enjoying a luxurious bath. I would love to stay here if ever I would visit Georgetown. Oh my! The rooms here look incredible – and that corner Jacuzzi bath would be so refreshing after backpacking round the continent! It’s been a while since we visiting Penang, but the Hotel Penaga will definitely be at the top of list for places to stay when planning our next trip! I have always wanted to visit George Town for its world famous realistic wall art. This hotel seems as a perfect base for that. It’s a relief to know that the staff speaks English. Communication can be a big deterrent at times. I’m planning to visit Malaysia and this post comes at a right time! 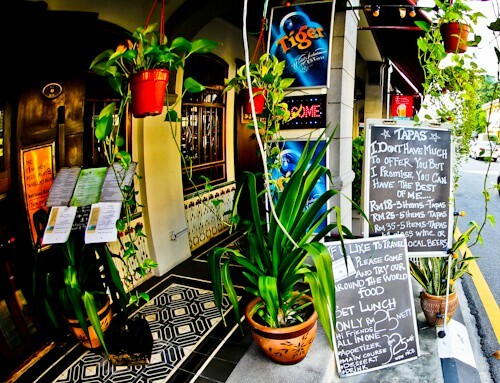 George town looks fab and the hotel looks too cosy and a great place to chile while near Penang. I would love to try! What a beautiful place! I love the tile work – just stunning! That is a form of art I love to explore when we travel. If possible I purchase one as a souvenir. They are so pretty displayed in a cupboard. ooo i love the swimming pool! Looks like a great place to stay. I’ll keep it bookmarked in case I ever back it to penang! I love traveling to UNESCO sites, and would love to stay close to the one in Malaysia, especially at this hotel. It has a nice charming, yet rustic feel to it. The tiles in the pool at beautiful! Great review. I have longed wanted to see Georgetown due to the realistic art on its walls. This hotel seems like a good base. I am most amazed by in room Jacuzzi and massage shower. I loved the way you clicked the picture of the room. Unique style. A jacuzzi in every room. 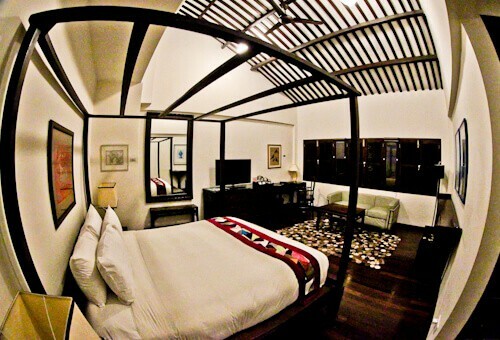 Definitely one of the USP of the hotel apart from being located inside the UNESCO world heritage city of Georgetown. I would gladly spend the day chilling it out in the swimming pool with a beer in my hand. Would definitely like to sip the best cocktails of the town in the Tanglung bar. I used to live in Penang and didn’t know the existence of this hotel! I love that there’s a jacuzzi in every room! 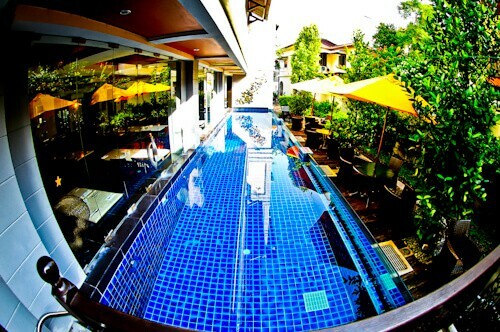 That swimming pool is the perfect place to relax given that the hot weather in Penang. I’d spend quite a lot of time at the spa for sure! wow I totally loved your review on this hotel,and your pictures are perfectly beautiful <3 Jacuzzi in a room is definitely a big YES. Excellent review, James! Seems like a place I’d love to stay in.What did you like best in George Town?